An Address to His Honor Lieutenant Governor Davey, presented by the Inhabitants of His Majesty’s Settlements on Van Diemen’s Land. Dated the fifteenth day of September, in the year of Our Lord, one thousand eight hundred and fifteen. With His Honor the Lieutenant Governor’s Answer thereto. Hobart Town: Printed by Andrew Bent. 1815. The earliest surviving pamphlet printed by Bent. Printed in Sept. 1815, possibly before he became Government Printer. By April 1815 the bush-ranger problem was so dire that Davey desperately (and illegally) declared martial law. The address was drawn up on 17 August at what Rev. 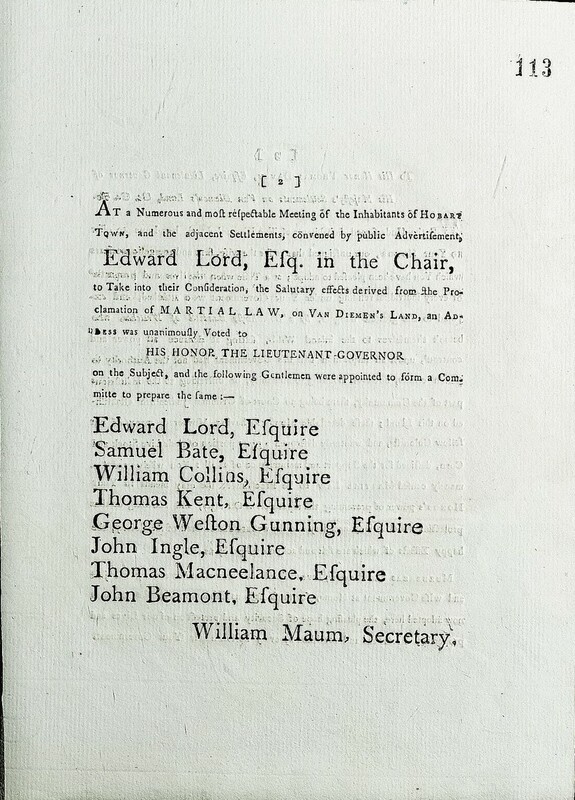 Knopwood described as ‘a great meeting of all the officers,’ convened by public advertisement and chaired by Edward Lord. It congratulated Davey on his firm, wise and energetic measures and prayed for the continuance of martial law and for a local criminal court. Around 500 free men signed, so despite a few documented refusals, the address had all the appearance of a spontaneous outpouring of public support. It is not clear whether Bent printed the address for the committee, or at Davey’s behest. He is not designated Government Printer in the imprint. By this time Davey knew his days as Governor were numbered and, anxious to defend himself against mounting criticism from Governor in Chief Macquarie, began sending despatches directly to the Colonial Office. He may have orchestrated the whole exercise. Either way the address was a very useful document for Davey. In all copies the title page appears to have been printed on the verso of the first leaf. This error may suggest the pamphlet was printed in a hurry. The Jefferson whaler was about to sail for England and almost all government business virtually ceased for a couple of weeks while Davey prepared his despatch and supporting documentation. It may also reflect Bent’s inexperience in pamphlet printing at that time. The page numbers are assigned opposite to the normal convention as they were in the compilation of government orders printed by George Clarke in 1814. 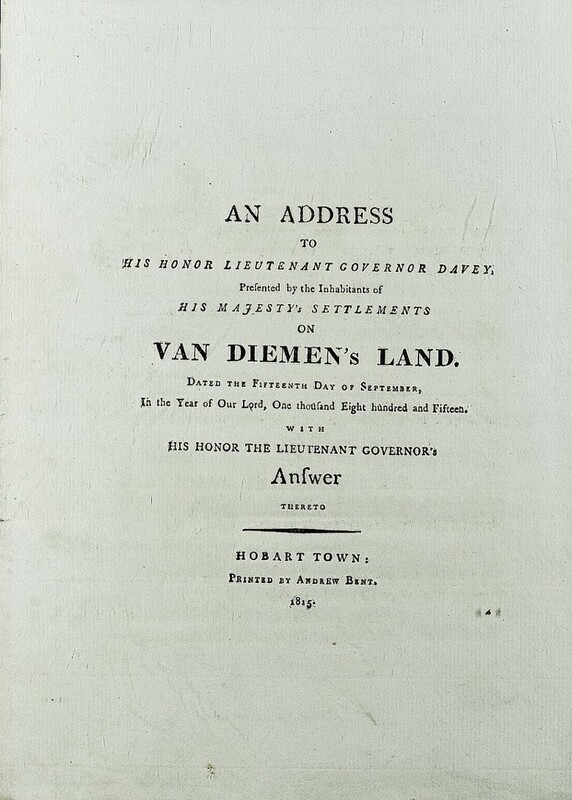 Copy of an Address to His Honor Lieutenant Governor Davey, received from the Inhabitants of His Majesty’s Settlements on Van Diemen’s Land. Dated the fifteenth day of September, in the year of Our Lord, one thousand eight hundred and fifteen. With His Honor the Lieutenant Governor’s Answer thereto. Hobart Town: Printed by Andrew Bent. 1815. A variant printing of the previous item, with the same peculiar pagination. Minor differences in title and content but the later version has been completely reset. Not clear if the reprint was made for Davey, or was an early commercial initiative by the printer. The only surviving copy is bound with other items, including the proclamation revoking martial law of 2 Oct. 1815, in a volume inscribed by Davey’s son in law, Colonial Surgeon James Scott. Port Regulations and Orders, to be observed by all Masters and Commanders of Vessels, whether British or foreign, on their arrival at the River Derwent; and by all Merchants, Importers, Consignees, and Others resident in His Majesty’s Territory of Van Diemen’s Land, &c. &c. &c. Hobart Town: Printed by Andrew Bent, Government Printer. 1815. The earliest surviving imprint by Bent as Government Printer. Regulations dated 14 November 1815. Ferguson’s description of the paper as ‘rough’ is perhaps an understatement. Has the same peculiar pagination as the two versions of the Address to Davey. Printed for Edward Lord and filled out by John Stott 11 May 1818 promising to pay £4.6.6 for value received. Another example possibly as item 1 from Lot 127 at Clifford Craig sale. Printed promissory note. Wm. 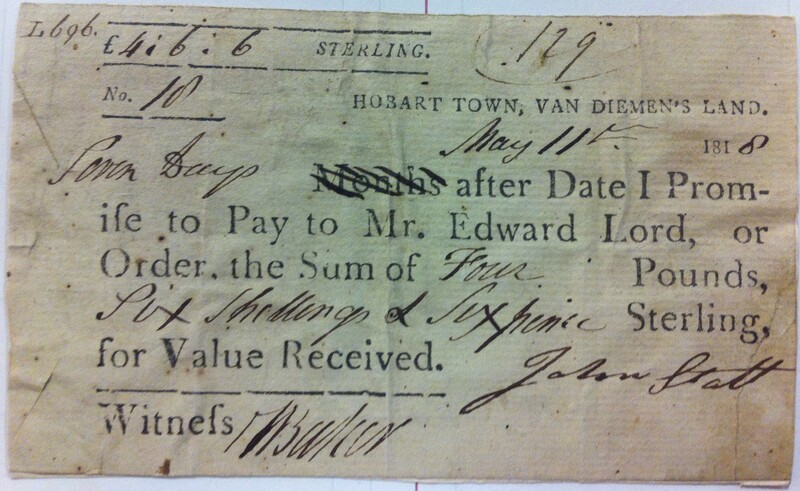 Blyth promises to pay Mr Edward Lord £40, dated 31 May 1819. Current whereabouts unknown.